The Spirit Parapan American Challenge project consists of implementing 40 interactive assemblies in 40 English speaking schools and summer camps in the Province of Quebec between April 1st and August 15, 2015. The project will reach 12,000 – 15,000 kids from age 7 to 17 as well as educators. Through the interactive assemblies, the children and educators will learn about the Pan and Parapan American games, the importance of teamwork and being active, to better understand what it means to live with a physical impairment and how people overcome obstacles and challenges. Dynamix, a leader in team-building and character development for kids will be animating the assemblies. Implement 40 interactive assemblies in 40 different schools and summer camps in the Province of Quebec between April 1st and August 15, 2015. 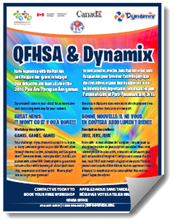 Promote the interactive assemblies through QFHSA and Dynamix’s network of schools. 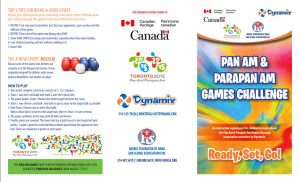 12,000 – 15,000 flyers will be handed out to students describing the 2015 Games and encouraging them to get active. 12,000 – 15,000 children and their educators will learn about the Pan and Parapan Am Games and learn about the importance of teamwork and being active. They will also learn to better understand what it means to live and play with a physical impairment and how people overcome obstacles and challenges to achieve their goals. And they will have fun while doing it! Each child will receive information on the Pan and Parapan Am Games as well as a fun game for them to play with their friends that reflects the spirit of the Games.